Un tutorial mai vechi legat de debounce pe mai multe porturi. Recently I faced a problem that gave me headaches. For an application I need to debounce 7 push buttons witch were connected on different ports. Searching the internet I found two ways to do this, namely: hardware method that involves an extra circuit and a software method that involves only code changes. 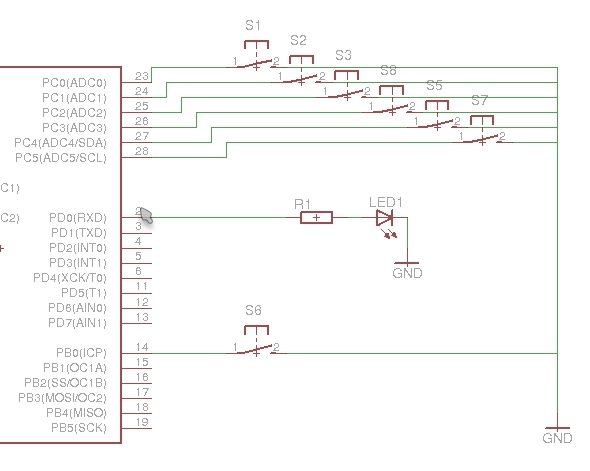 Due to the fact that I’m not a hardware expert but also because I didn’t want to further complicate the circuit I have chosen the software method. Next I will discuss the method used by me to solve this problem detailing a bit principles used and finally I will present you a working example. 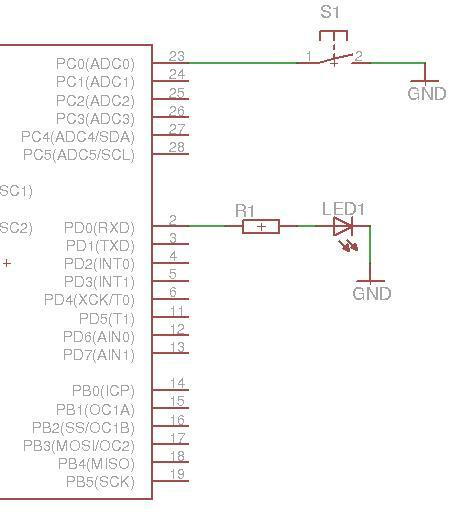 Take the example of a circuit consisting of a microcontroller which is connected to an LED and a push button. What we want to happen is that when you press the button, the LED to be switched on and when you press again the button LED to be switched off. The only problem is that the circuit works in a chaotic manner. And if you look very carefuly you can see that the LED will blink intermittently when pressing the button. This blinking effect is seen best on incandescent light bulbs. If you wonder why this happens let’s look at the chart below and see what happens when you press the button. 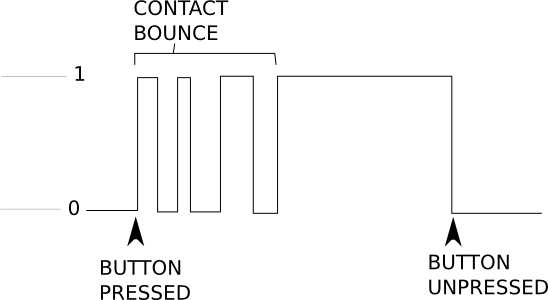 Because the contacts inside the button are elastic, when contacts are touching each other there will be a variation of some milliseconds between position open/closed of the switch, which is observed on the chart above. As I said above to eliminate the effect of „bouncing” there are 2 methods. Do you remember our test program? If so, lets create a procedure for debounce. Have you seen the difference? Simple and to the point. The only thing I hate at this method is that when the button is hold, the LED will turn on / off making a light organ effect. We will not modify our program using the timers method because we will discuss it later when we speak about virtual port. The best code for the timer method I discovered on Peter Fleury page. For more details please check the link below. 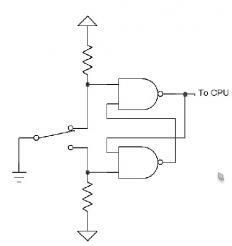 The problem I faced recently was that I needed 7 inputs on the microcontroller but I had a free port with 6 pins and on another port I had 1 pin. To all these inputs I had connected push buttons. The circuit was controlling incandescent bulbs where the bounce effect is clearly visible, so all inputs had to be debounched. First I tried the pooling method but I disliked because it create an effect of light organ. 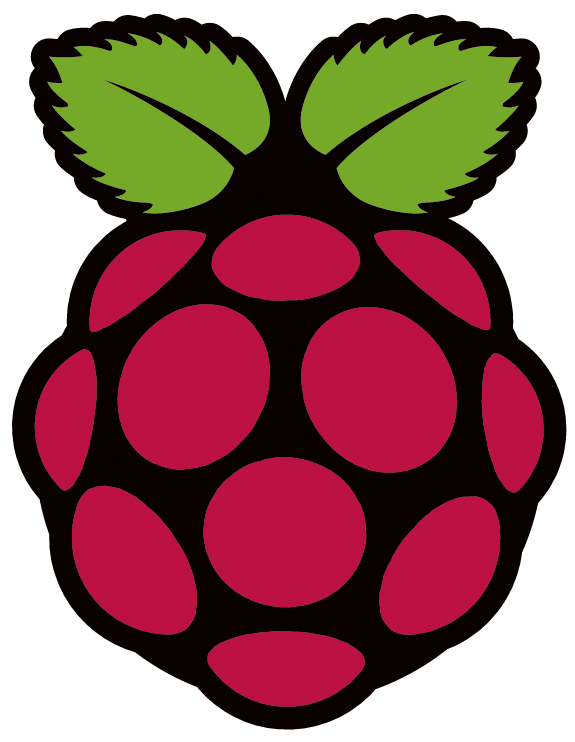 After more searches on the Internet and many other headaches I seem to have found the perfect solution with the timers method and creating a virtual port. In the following I will try to explain how to create a virtual port with the logical functions of C.
that is exactly what we wanted. i = key_state ^ (~protvirt); // key changed ? i &= ct0 & ct1; // count until roll over ? * in global variable key_press is set. I think the comments attached to lines of code are enough to explain it. The only change made to this procedure was to add the line defining the virtual port within the procedure to have all the time the last status of the bits. Where 0x01 will change depending on the pin that we want to interrogate. As I have promised you can download the functional example from the link below. Comments and suggestion are always welcomed. Also if you want you can help me improve the code for example to detect double clicks.